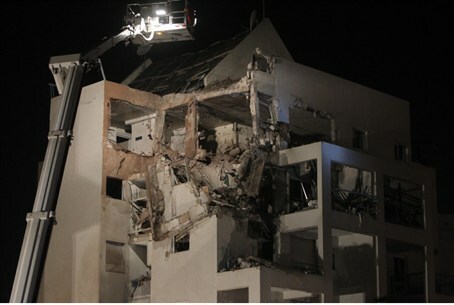 A rocket hit a building in the central Israel city of Rishon Letzion. Two rockets hit the city of Ashkelon, wounding three people. Gaza terrorists continued firing on Israel on Tuesday evening. A rocket fired at the city of Rishon Letzion in the Tel Aviv region struck a six-story building, causing extensive damage. One woman was lightly wounded in the attack. Rockets fired at the city of Ashdod were shot down by the Iron Dome system, but two rockets struck the city of Ashkelon, wounding multiple people. Of the rockets that struck Ashkelon, one hit a building in the city, and the other hit a parking lot. Paramedics reported that one man was seriously wounded in the Ashkelon attacks, and two others were lightly wounded. Several people suffered shock. The most seriously wounded victim suffered critical injuries to his limbs and was taken to Ashkelon’s Barzilai hospital. Earlier in the evening several people were wounded in two rocket attacks on Ashdod. Several other rockets were shot down by Iron Dome.